A tsunami is a series of ocean waves generated by sudden displacements in the sea floor, landslides or volcanic activity. In the deep ocean, the tsunami wave may only be a few inches high. The tsunami wave may come gently ashore or may increase in height to become a fast moving wall of turbulent water several meters high. On the 28th, lava broke out on the southwest flank and created a 15-mile flow to the sea. Over 300 strong shocks were felt at Kaʻū and 50 to 60 were felt at Kona. Between March 28, 1868 and April 11, over 2,000 distinct shocks were felt at Kona. The main shocks struck on April 2, at 4:00 p.m., and again on April 4 at 12:30 a.m., the epicenter was located near Waiohinu. At Keauhou (now Keauhou Landing) the water rose 35-50-feet destroying all the houses and warehouses and drowning 46 people. At Hilo, the height of the wave was about 10-feet, and at Kealakekua, 6-feet. 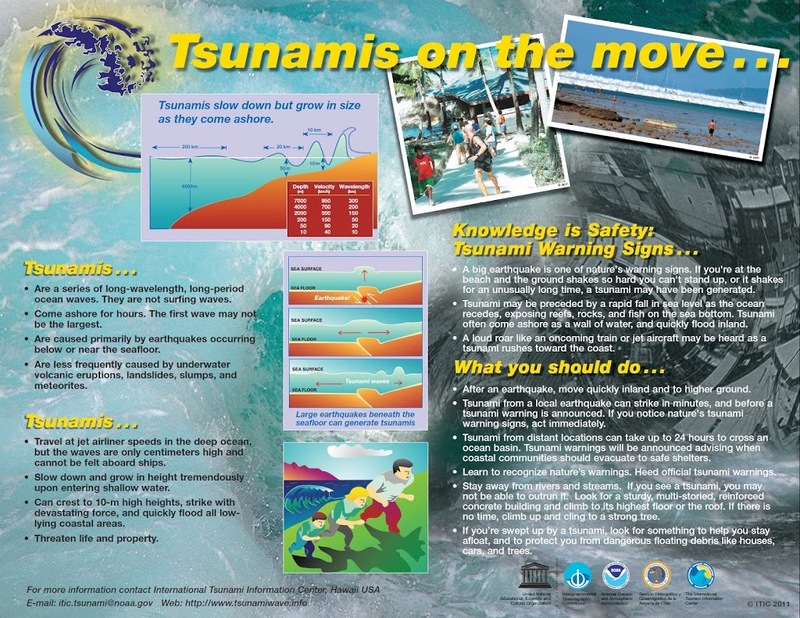 The tsunami also was observed on Maui and Oʻahu. Also felt on Lānaʻi, Maui, Oʻahu, and Kauaʻi. Along the Puna coast, the land subsided in places as much as 6-feet. At Kaimū, trees stood about 8-feet deep in sand and water. The plain at Kalapana sank about 6-feet, and water stood as much as 5-feet deep over 20 acres of formerly dry land. In the 20th century, an estimated 221 people have been killed by tsunamis. Most of these deaths occurred on the Big Island during the tsunamis of 1946 and 1960, two of the largest tsunamis to strike in the Pacific. The tsunami of 1946 was generated by a magnitude 7.1 earthquake in the Aleutian Islands. This tsunami struck the Big Island of Hawaii on April 1st. The tsunami flooded the downtown area of Hilo killing 159 people and causing more than $26-million in damages. On November 4, 1952 a tsunami was generated by a magnitude 8.2 earthquake on the Kamchatka Peninsula in the USSR. In Hawaii, property damage from these waves was estimated at $800,000-$1,000,000 (1952 dollars); no lives were lost. The waves beached boats, caused houses to collide, destroyed piers, scoured beaches and moved road pavement. On March 9, 1957 a tsunami was generated by a magnitude 8.3 earthquake in the Aleutian Islands. It generated a 24-foot tsunami that did great damage on Adak Island, especially to the fuel and oil docks. The Hawaiian Islands incurred about $5,000,000 of damage in 1957 dollars. The highest wave in Hawaii was 12-feet. The tsunami of May 23, 1960 was generated by a magnitude 8.3 earthquake in Chile. The 35-foot tsunami struck Hilo, Hawaii causing severe damage. 61-deaths were recorded and $23-million in damage occurred. In the area of maximum destruction, only buildings of reinforced concrete or structural steel and a few others sheltered by these buildings, remained standing – and even these were generally gutted. Frame buildings were either crushed or floated nearly to the limits of the flooding. On November 29, 1975, an earthquake occurred off the coast of the Big Island of Hawaii. When the quake-generated tsunami struck, 32 campers were at Halape Beach Park. The sound of falling rocks from a nearby cliff, along with earth movement caused the campers to flee toward the ocean. They were then forced back to the cliff by rising ocean waters. The first wave was 5-feet high, but the second wave was 26-feet high and carried the unfortunate campers into a ditch near the base of the cliff, where they remained until the ordeal ended. Two campers died and 19 suffered injuries. An earthquake measured at 9.0 magnitude, the sixth biggest since 1900, struck Japan on March 11, 2011. The first tsunami waves reached Kaua‘i shortly after 3 a.m. and took about 30 minutes to sweep through the island chain. Waves above 6-feet were recorded at Kahului on Maui and 3-feet at Haleiwa on the north shore of Oahu. Lost homes, sunken boats, Kona Village Resort damage, and damaged piers and roads caused tsunami damage into the tens of millions of dollars; no one was killed or injured during the tsunami. 1950s-Haleiwa-shows people catching stranded fish during the receding tsunami at Hale’iwa. 1957 tsunami. 03-09-57 Arrival of a major wave at Laie Point on the Island of Oahu. (National Geophysical Data Center). 1957-Laie-tsunami. 03-09-57 Arrival of a major wave at Laie Point on the Island of Oahu. (National Geophysical Data Center). 1960-Hilo destruction left in the wake of tsunami generated by earthquake of May 22, 1960, off the coast of Chile. 1960-Hilo-Hilo Waterfront – On May 22, 1960, at 19-11 GMT, an earthquake occurred off the coast of South Central Chile. 1975-Halape palm grove, dead from immersion in sea water. 1975-Halape- view of the Halape coast after the 1975 tsunami. 1975-Halape- view of the Halape coast before the 1975 tsunami. 1975-Halape-Scout Troop 77 – Halape. Two days after this photo was taken on November 29, 1975, a 30-foot tsunami washed over their camp site. 1975-Punaluu-locally generated tsunami. 11-29-75 Damage at Punalu’u, on the Big Island of Hawai’i. (Pacific Tsunami Museum Archives). 2011-Kona-kailua-kona_flooding_2011_ tsunami wave flooding in Kailua-Kona, Hawaii on March 11. Note that pier is covered. 2011-Kona-kailuakona_receding_water_2011_tsunami wave receding in Kailua-Kona, Hawaii on March 11. 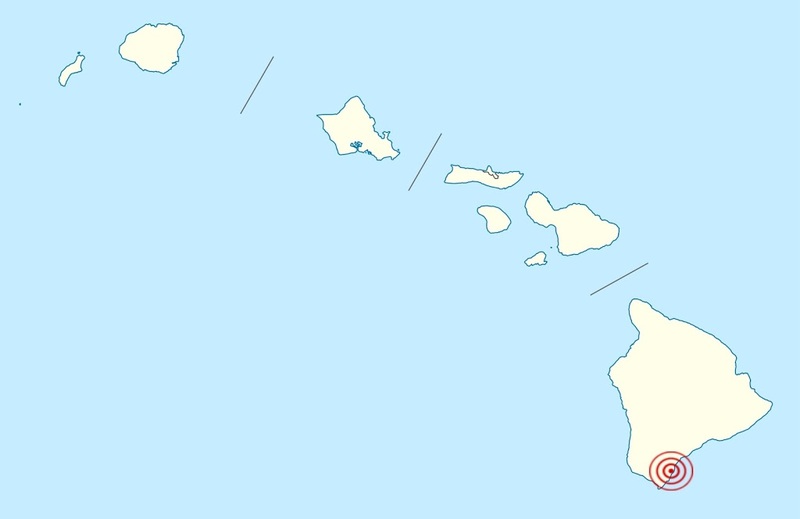 Mokuola was repeatedly struck when tsunami entered Hilo Bay. In the Islands, there was no assigned garrison here until August 15, 1898, when the 1st New York Volunteer Infantry regiment and the 3rd Battalion, 2nd US Volunteer Engineers landed in Honolulu for garrison duty. They setup camp (‘Camp McKinley’) at Kapiʻolani Park. 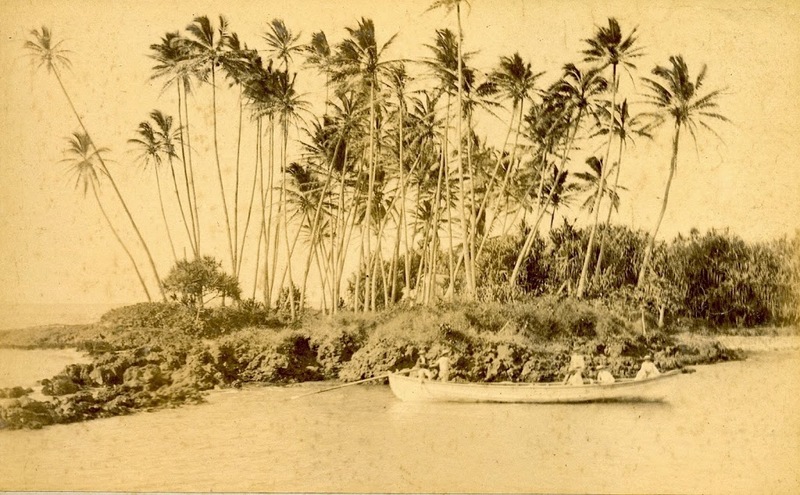 In 1900, the Hilo Swimming Club petitioned the government to designate Mokuola as a recreation area. Swimming facilities including a bathhouse and diving boards were built. In 1910, a 30-foot-high wooden diving tower was built with platforms at 5-foot, 14-foot, and 30-foot levels. After it was destroyed in the tsunami of 1923, a stone tower was built with two levels, steps, springboards, and railings. The 1960 tsunami washed completely over the island, destroying all buildings and the new bridge there. For three years, Mokuola was abandoned. Funds were eventually allocated for a major restoration project of the island, including a new metal and concrete bridge, and new concrete walls to slow erosion. By 1969 the bridge was completed and the park was re-opened to the public. (Miller) It remains a public park. The image shows Mokuola. (DMY) In addition, I have added others similar images in a folder of like name in the Photos section on my Facebook and Google+ pages.